After losing her brothers and father in raids by another nation, Hroka joined battle herself to honor them. Her badly outnumbered tribe rallied around her fierce fighting and drove back their foes at great cost. Though they were never married, she now considers herself the widow of the bravest warrior in that battle, after he took to heart her own drive for vengeance and saved her life in doing so. Hroka is a Zephyri gladiator. Sculpture credit belongs to MIKH, illustration by Amber Jones. Paint by Benjamin Williams. 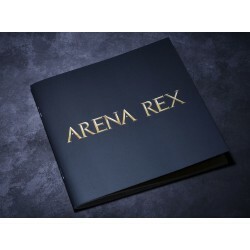 The resin Hroka miniature is supplied unassembled alongside a plastic 30mm Arena Rex base, activation token, art card, and game card.